Vantage XT takes comfort to new levels with back, bottom, Boa® lumbar and kick stand adjustability. Made with breathable mesh and extruded aluminum, it lets your skin breathe naturally, while providing a strong and durable frame, in the boat or on the shore. Mount a standard foot-controlled trolling motor to the bow of the Pro Angler 17T. It comes with the hardware needed to easily install using the provided molded inserts and is removable for transportation and secure storage. Rating: 55 lbs. of thrust, about 1 HP or 700 watts. 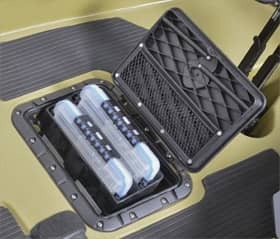 Specifically designed for transporting the Pro Angler 17T with optional cradles and optional dolly kit to hold the boat securely and make it easy to load and offload. The Livewell XL includes a 6V sealed gel cell battery and has an adjustable two-level capacity (6 gal/22.71 L and 11 gal/41.64 L).